Canopies offered are both potable as well as instant. Some folks call these pop-up tents or ez-up canopies but any way you call them they make for a versatile as well as portable shade structure. 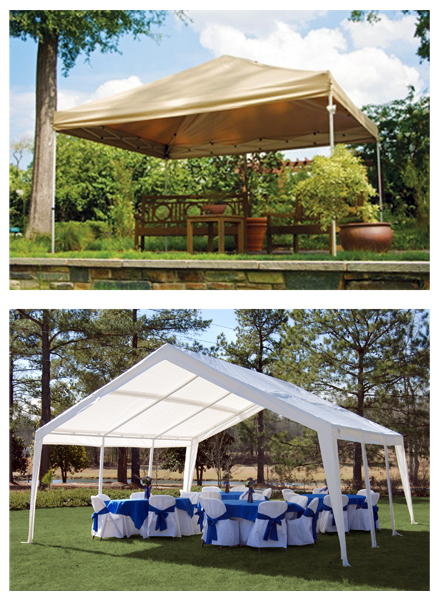 These portable and instant pop-up canopies are easy to set up and just as easy to take down. Whenever or wherever you find a need for a canopy to shelter your car, boat or sell crafts at a fair these portable and instant canopies can do a great job providing protection from the elements and are built of such high quality that they are sure to last for many seasons. Incorporated into these heavy-duty portable shelters are corning bracing, skylights, beefed up steel poles not aluminum and woven steel cable roof truss systems capable of supporting snow loads. Even if you live north of the Mason Dixon line you can find these functional, versatile canopies will go a long way to protecting your equipment in most any type of weather condition plus they are sturdily built to last a lot longer than just one season. Please note that these products can only be shipped within the continental U.S.